(CNN) Oklahoma legislators approved a measure including a $6,100 pay raise for teachers, but the state teacher’s union says the bill doesn’t go far enough and plans to walk out Monday. House Bill 1010XX, which was described as “the largest teacher pay raise in the history of the state” passed both the state House and Senate this week. Gov. Mary Fallin signed the bill on Thursday. For weeks, Oklahoma teachers have been considering a walkout over what they say is their breaking point over pay and education funding. The state ranks 49th in the nation in teacher salaries, according to the National Education Association, in a list that includes Washington, D.C. Mississippi and South Dakota rank lower. 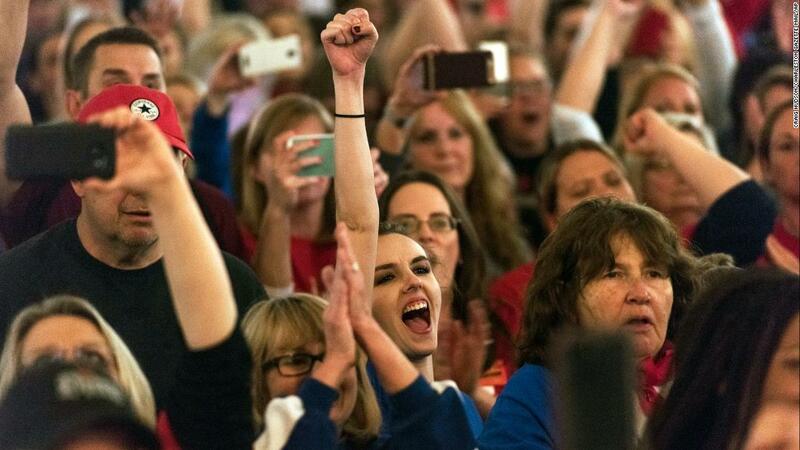 Inspired by the West Virginia strike in which teachers demanded and got a pay raise from state leaders earlier this month, similar efforts have taken off in Oklahoma and Arizona. The Oklahoma Education Association, the state’s largest teachers’ union that represents nearly 40,000 members and school personnel, called the passage of the bill “a truly historic moment,” but one that remains “incomplete,” according to its president, Alicia Priest. Oklahoma City Public Schools said all classes and activities are canceled for that day because of the walkout. “We asked for $10,000 over three years. This gets us part of the way there, and so we need to have the Legislature guarantee that we are still working to get to that,” Priest had told CNN affiliate KFOR. In Arizona, thousands of teachers and supporters wearing red swarmed the state Capitol on Wednesday, calling for higher pay and better education funding under what they called #REDforED. The color red was meant to convey their frustration, which they say has reached a crisis level. 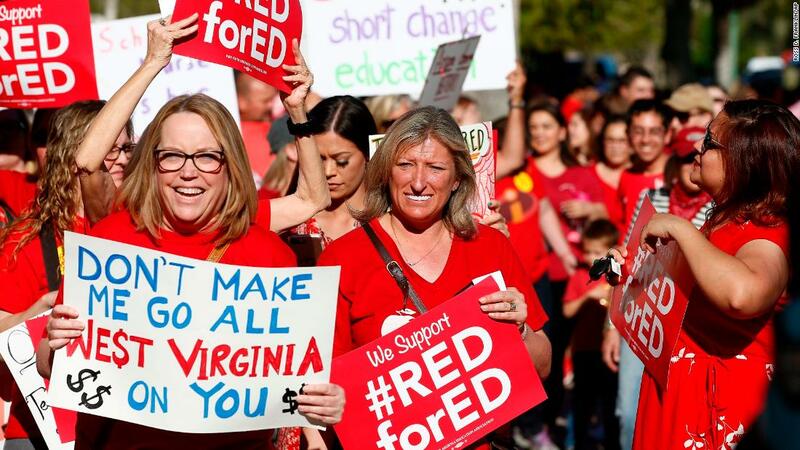 Teachers have been wearing red shirts every Wednesday and encouraging supporters to do the same, according to the Arizona Education Association, which has 20,000 members who are teachers, counselors, bus drivers and retired educators. Educators wore stickers reading: “I don’t want to strike, but I will.” The rally drew about 2,500 people, the Arizona Department of Public Safety told CNN affiliate KNXV. Arizona Educators United, a coalition of educators, demands a 20% salary increase for teachers, competitive pay for all education support professionals, as well as education funding restored to 2008 levels. “Our classrooms go without updated textbooks, basic supplies, and technology. We have among the highest class sizes and school counselor loads in the nation, making it difficult to meet the individual needs of our students,” the group stated. Arizona ranks 43rd in the nation in teacher salaries, according to the National Education Association. Teachers say they are overworked and underpaid. They want better pay and are encouraging each other to organize via social media. They’re hoping their very public display of frustration will pressure state leaders, such as Gov. Doug Ducey. State Sen. John Kavanagh, the Appropriations Committee chairman, told KNXV that tax increases to pay for K-12 education are off the table, as voters have opposed the idea in the past.